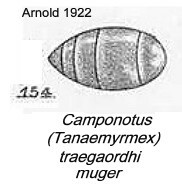 Note: From the type images (below) the major workers of fumeus and muger are identical. The traegaordhi and muger collection data also appear to be identical. Santschi's (1914e) description is at . 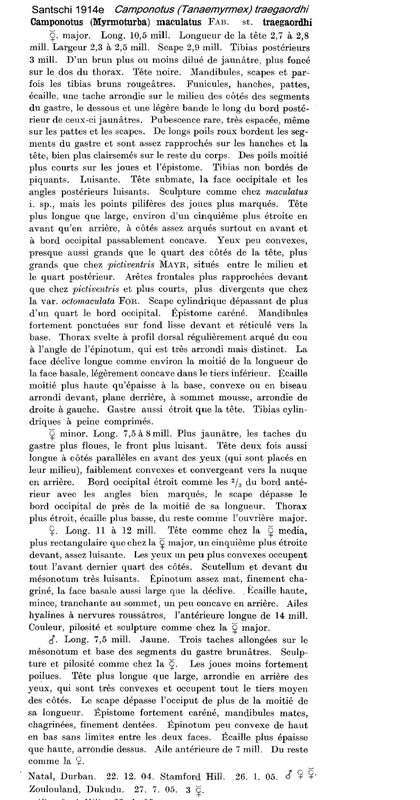 Forel's (1914d) description of muger is at . 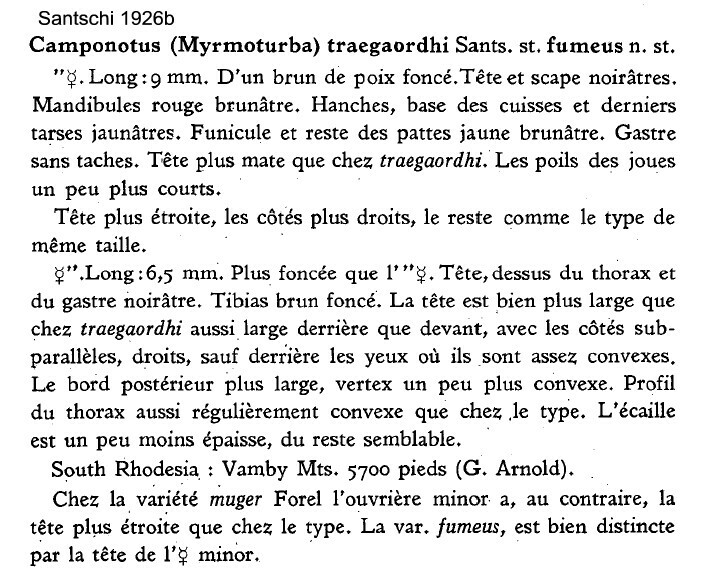 Santschi's (1926b) description of fumeus is at . Arnold (1922: 628) provided an illustrated translation; this is at . Wheeler (1922) noted several findings from South Africa. Bernard (1952) noted that it is a small species, geographically previously known only from southern Africa (noting the Santschi and Arnold records). Curiously, it was abundant at higher levels in the Mt. Nimba, Guinea, survey. Type form traegaordhi were found at Camp IV (1000 m) and Pierré-Richard (900 m), fairly common, more frequent at Mount Tô (1600 m); numerous workers, one queen. Subspecies fumeus was more abundant than the type, although variable, at Mount Tô, also two queens; a queen from Nion probably was of this form. The specimens shown below from Cameroun, Congo and Central African Republic add weight to Bernard's note, with the proviso that there are no available images of the type form. The photomontage is of a minor from Congo, Réserve de Lésio-Louna; collector Eric Zassi (pitfall trap 19, t 1.1).